On this page we discuss about dissolved chemicals in water. Chemicals that are dissolved in water cannot be removed by simple filtration. Some salts dissolved in water are not toxic in small quantities, but there is a limit which can be tolerated by our bodies. For example, Sodium Chloride or the common salt, is being used by us daily to flavour food, but that does not mean that we can drink sea water which contain a high percentage of sodium chloride or salt. So the individual salts, dissolved in the water, may not be toxic in small quantities, but there is an upper limit to these dissolved solids in our drinking water. The full form of TDS is 'Total Dissolved Solids'. The meaning of TDS in water is that it is a measure of how much chemicals there is in water. TDS is a technical term used to give a measure of the amount of dissolved matter in the water. TDS is usually expressed as 'ppm' which stands for 'parts per million' or as 'milligrams per liter' (mg/L). For convenience, usually the electrical conductivity of the water is measured and converted by using a multiplication factor to give an approximation of the TDS in water. The World Health Organization or WHO and most of the governments around the world has set an upper limit for the TDS - Total Dissolved Solids of non-toxic salts in water to 500 ppm (parts per million) or 500 milligrams per liter of water. Most of our Public supplied water is safe with regards to TDS, but it is a good idea to check. Some of the effects of dissolved chemicals in water are to make the water acidic or basic and this is measured by the 'pH' of water as explained below. Another common effect of dissolved chemicals in water is called 'water hardness' which is also explained below. Ordinary filtration cannot remove chemicals from water. Distillation of the water is one method to remove salts from water, but this requires a lot of electricity or fuel and is not practical for domestic use. The other most common way to get rid of dissolved solids is by a water purification process known as Reverse Osmosis or RO which is described in detail in a separate page on Membrane water purification in our site. pH is a value that determines if a substance is acid, neutral or basic, calculated from the number of hydrogen ions present. The initials pH stand for "Potential of Hydrogen". It is measured on a scale from 0 to 14, on which 7 means the substance is neutral. 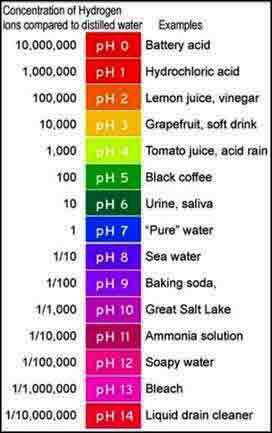 pH values below 7 indicate that the substance is acidic and pH values above 7 indicate that it is basic or alkaline. Pure water has a pH of 7 which means that it is neutral. Carbon Dioxide when it dissolves in water produces an acid and lowers the pH, like in fizzy drinks. The allowable drinking water pH level as per International Drinking Water Standards is between 6.5 and 8.5. All public utility companies must maintain the tap water pH level between 6.5 and 8.5 as per law. Water with a pH of less than 6.5 is acidic and corrosive to metals and could have a sour taste. Water with a pH of more than 8.5 could indicate that the water is hard. Because the pH scale is logarithmic, a difference of one pH unit represents a tenfold, or ten times change. For example, the acidity of a sample with a pH of 4 is ten times stronger than that of a sample with a pH of 5. A difference of 2 units, say from 5 to 3, would mean that the acidity is one hundred times greater, and so on. On the right above is a graphical representation of the pH values of some common items. There are several methods to measure pH in water but the easiest is to use water pH test strips which are available from almost all online shopping sites like Amazon. Digital pH testing kit for water is also available, but these would not be necessary for a household. Hardness in water is caused by dissolved salts of Calcium and Magnesium. Hard water is not harmful to health as long as the TDS is within the limits. Hard water can be ‘softened’ by replacing the Calcium and Magnesium with Sodium in an Ion Exchange Water Softener. For washing clothes, treating the hard water with Sodium Carbonate or washing soda, reduces many of its problems. Water Softener, Nanofiltration and Reverse Osmosis RO water purifiers make hard water soft. We have a dedicated page on Hard Water. We give below the most common chemical contaminants found in water. Each of these chemical contaminants is described in detail including how the chemical effects our health. Iron causes a rusty or metallic taste in water and it can also stain clothes. Iron in water is not harmful to human health, but water containing iron salts can have a bad taste and may be discoloured. Iron and manganese occur naturally and most ground water has some amount of dissolved iron and manganese. Aeration (the addition of air to the water), Green Sand filtration, chlorination, and dosing hydrogen peroxide or Potassium permanganate are some of the remedies to get rid of Iron. RO will remove dissolved Iron and Manganese. Salts of Arsenic, Barium, Cadmium, Chromium-6, Lead, Mercury, Selenium, and Silver are regulated by the EPA and almost all drinking water standards of the world including the Indian water standards for drinking water. These water standards assign a maximum contaminant value usually expressed in parts per million or mg per liter. Even though Aluminium is not in the regulated lists of WHO, EPA, etc. there has been links of Aluminium to diseases like Alzheimer's and dementia. So we have included it in our list of dangerous chemicals in drinking water. Aluminum in water is not regulated but recent research has revealed a link between aluminum intake and possible adverse effects on human health and its possible role as a cause of Alzheimer's disease and Parkinson's disease. With these doubts being raised it will be a wise decision to not use Aluminum cooking vessels. In this respect we must also point out that almost universally, in all municipal size plants, Aluminium Sulphate or Alum is used as a coagulating agent for the sedimentation of suspended solids. For sure some of this aluminum will be present in the municipal supplied waters. So an RO water purifier is the safest bet against all water problems. Fluorides are chemicals that contain the element fluorine. Fluorides occur in many water sources naturally. In some countries fluorides are added to drinking water as a health supplement for the protection of teeth and bones. Fluoride in water in very small quantities, about 1 to 1.5 mg per Liter or ppm - parts per million, is beneficial to health, but any excess is not good for health. Many toothpaste manufacturers add it in the toothpaste to protect the teeth against cavities. The EPA has set a maximum limit of Fluorides in water as 4 mg per Liter or ppm. Excess fluorides in water can have harmful effects ranging from discoloration or pitting of teeth to bone and skeletal damage. RO water filter purifier for removing Fluorides in water is the most effective treatment. The most common way Nitrates, Nitrites and Ammonia gets into our water sources, is due to the leakage or seepage of fertilizers or farm and animal wastes into the ground water sources. Nitrates in water are especially dangerous to infants under 6 months, causing 'methemoglobinemia' or the ‘blue baby syndrome’ due to the infant’s blood not being able to carry enough Oxygen from their lungs to their body. Adults may also be affected by nitrates and nitrites in water due to the formation of chemicals called nitrosamine in the digestive tract. The EPA has set a maximum limit for Nitrates in water as 10 mg per Liter or ppm measured as NO3 or Nitrate. RO water filter purifier for removing Nitrates in water is the most effective treatment. Organic chemicals in water make the water smell or taste bad and also give it some discoloration. These impurities of water can vary from pesticides, petroleum products and other various toxic chemicals. Chlorine which is used to keep water free of bacteria, causes another problem by reacting with some organic material in the water to form harmful chemicals like Chloroform, Trimethohalanes (TMHs), Haloacetic Acids (HAA), Trihalomethanes (THMs) and other "Disinfection by-products" (DBPs) or "Chlorination Disinfection by-products" (CBPs), which are all environmental pollutants and many considered 'carcinogenic', or suspected of causing Cancer. Activated Carbon filters are very effective in getting rid of such impurities in water which normally occurs in minute quantities. Certain minerals are radioactive and people who drink water containing it over many years may have an increased risk of getting cancer. Radon is naturally occurring and ground waters in some areas of India may be contaminated with it. The only way to be certain is to get the ground or well water tested. Activated Carbon filters are very good for the removal of radon from water supplies and it is the most common way to reduce Radon in the water. RO water filter purifier for removing Radons or radio active materials in water is the most effective treatment.